Actually, they aren’t likely to volunteer for extra games away from the Xcel Energy Center, but their 5-2 loss to the Washington Capitals on Tuesday night was nothing like the 5-2-0 road trip they completed to get within three points of first-place Nashville in the Central Division. Duby is goalie Devan Dubnyk, who’s on track for one of the best seasons of his career with an 8-4-2 record, a 2.34 goals-against average and a .927 save percentage. But he couldn’t do much to prevent Washington from jumping on a 3-0 second-period lead that held up, even as the Wild (11-5-2) got six power play chances against an opponent ranking 29th in the league while short-handed. 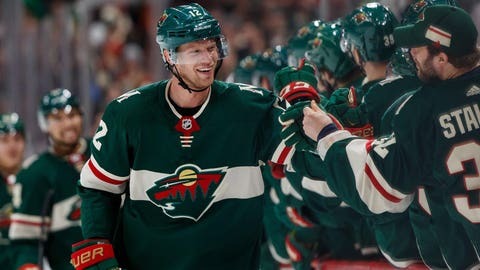 Minnesota’s one real chance to get back into the game came after Mikko Koivu got the Wild on the board with an unassisted goal midway through the second period. It carried play to the Capitals for the remainder of the period but couldn’t shift momentum with a second goal. Vancouver gave up a weird own goal that snapped a 1-1 first-period tie when Josh Bailey’s pass hit off the skate of Chris Tanev, then allowed a backbreaking fourth goal in the third period as Tom Kuhnhackl booted home a centering pass. It was allowed to stand, even though it appeared to be a kicking motion. The teams met Oct. 29 in British Columbia, with Vancouver dumping Minnesota 5-2 behind two goals from electrifying rookie Elias Pettersson. He has 10 goals and seven assists in 14 games, but hasn’t scored during his team’s losing streak.